Courtney Boyd Myers is the founder of audience.io. “What’s On Your Home Screen” is presented by Fueled, a New York and London-based mobile app development company that produces award-winning apps for big brands like Barneys to hot startups like QuizUp. From media, to food, to fashion, serial entrepreneur Soraya Darabi has left a trail of successful companies and products in her path. Now, as the co-founder of Zady.com, Soraya champions the slow-fashion movement, which encourages consumers to care about the artisanship that goes into every product purchased. Since launching in August 2013, Fast Company has named Zady one of The World’s Top 10 Most Innovative Companies in Retail. Just yesterday, Zady launched the “Sourced In” Movement, a new campaign to reform industry standards for supply chain transparency. The launch ties in with the debut of the startup’s first private label collection. When Soraya isn’t running pop-up holiday shops at New York’s busiest airports or educating the world on buying clothes with a “cost-per-wear” attitude, she’s hosting low key dinner parties with friends in the city and driving out to Westchester to spend quality time with family. We caught up with Soraya this week to find out what’s on her home screen that helps to keep her life balanced and while staying on top of business. 1. No unread mail, no unread messages, no missed calls… you’re a machine! What’s your secret? I’m not a machine. I have focused for years on creating a communication system for myself that works and allows me to stay on top of inbound. It’s a constant evolution and work in progress as more mediums are released each year for our snap-chatting pleasure. Part of that system requires learning how to say no, the most important word in the English language. For instance, I’m not on Twitter much anymore and I don’t have the bandwidth for it while running a company. My big secret is that I live and die by my to-do list and Google Calendar. In fact, I calendar myself as much as I calendar meetings with other people. 2. With YogaVida and MyFitnessPal occupying prime real estate, health is obviously an important part of your life – what tips do you have for other hustling entrepreneurs to stay healthy while building businesses? 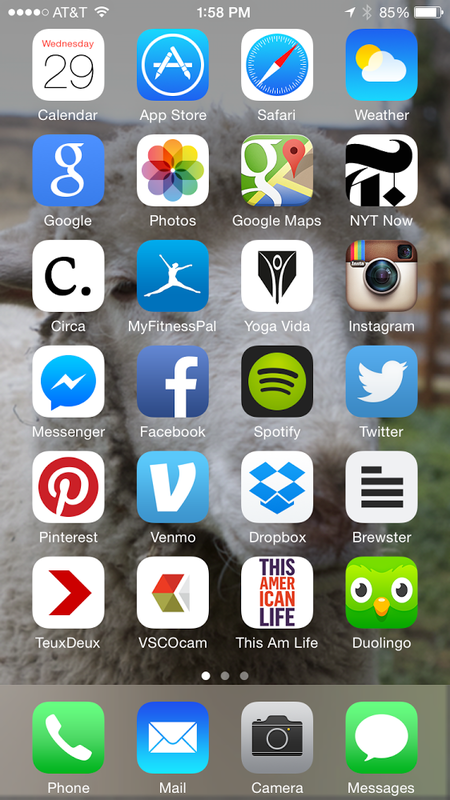 I place health and wellness apps front row and center, intentionally, as a daily reminder to be mindful about what I put into my body, and to remind myself to make time for breathing. Yoga on the weekends is an absolute treat and so when friends or colleagues ask if I’d like to have coffee on a Saturday or Sunday, I almost always suggest yoga instead with a green juice afterwards. My tip to hustling entrepreneurs is to combine networking with exercise, you’ll feel better and more energized at work if you do. 3. What have you found are the greatest tricks to building Zady’s audience on Pinterest? On Pinterest, we focus on inspiring images but also authentic. Aspiration has a new look, and it’s accessibility. So our goal with the images on pinterest.com/zadypins is to help women find timeless, classic looks to build an entire wardrobe from. We try to incorporate tips about tailoring, mending, repairing, brushing, and cleaning wool, finding the perfect fit, and “cost per wear” along the way. 4. What’s TeuxDeux all about? Tina, or as she is known online, Swiss Miss, first showed me this app years ago in her office in Dumbo and I’ve been hooked ever since. It’s the ultimate mobile/Web to-do list. I organize my life by priorities and by day, and try to get through as much of my TD list each week as possible. TeuxDeux introduced new features lately, including color choice, which helps me stay extra organized. The simplicity of this app is what makes it work for me. 5. What language are you learning on DuoLingo and why? French. I studied it for many years in high school and college but haven’t kept it up so much as an adult. DuoLingo is, quite possibly, the greatest app of all time. There, I said it. 6. Favorite American Life podcast? Sophie’s Choice. Probably Switched at Birth from 2008. At least, that’s the one that has stuck with me the most after all these years. Or any episode with David Sedaris. 7. Which app do you check first when you wake up in the morning? And which app before you go to bed at night? I check my news apps first. Circa for immediate headlines, then NYT Now. You can take the girl out of the newsroom, but…. Who do you think we should check in on next? Let us know in the comments below.